Art by simple definition is described as something created with imagination and skill, expressing ideas or feelings. It takes on countless forms. For some, art is a painting of a woman hanging in le Louvre in Paris, coyly smiling whilst the visitor studies each brushstroke. Others hear it in Antonio Vivaldi’s 42 min masterpiece, the Four Seasons with each note describing the spring, summer, autumn and winter with sounds triggering emotion after emotion. Then there are sculptures, such as David by Michelangelo, baring no shame in all his masculine glory. And yes, like it or not, those cat videos you see on the internet are also a form of artistic expression. I had the chance to sit and speak with art, in the form of man. Art Rotondo by simple definition is talent incarnate. Much more than another exceptionally talented painter, sketcher, designer or person. 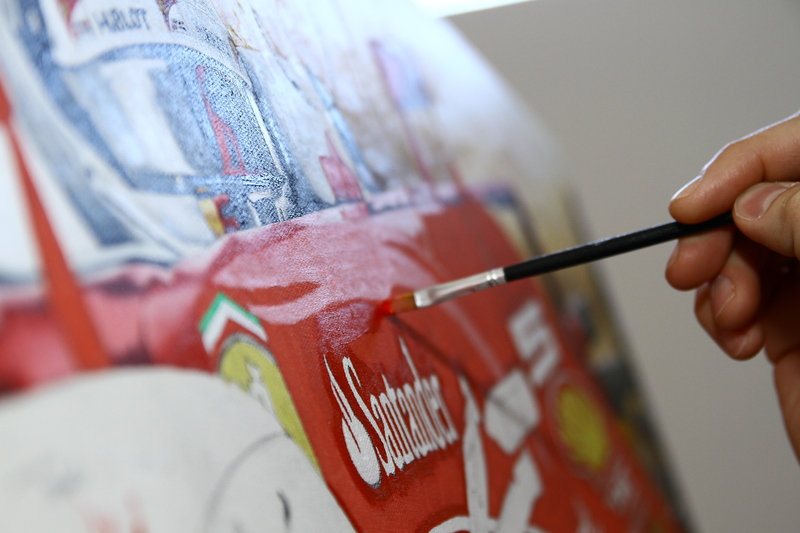 Art Rotondo is a passionate fan of Formula 1 in which many of you have seen his work already without knowing it. 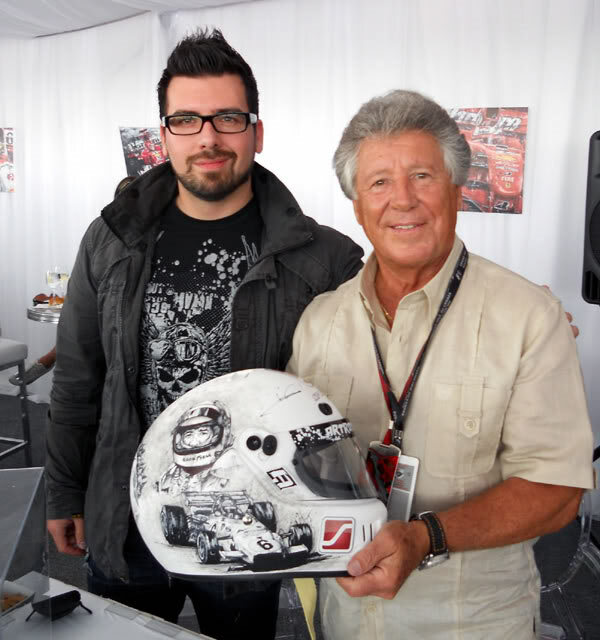 His talents have been sought after to paint helmets for Mario Andretti, Alexander Rossi, Sir Stirling Moss, Adrian Sutil, Gary Paffett, Graham Rahal and more. His work has also been seen in the form of ice hockey goaltender masks in the NHL and in the squared circle of the WWE. 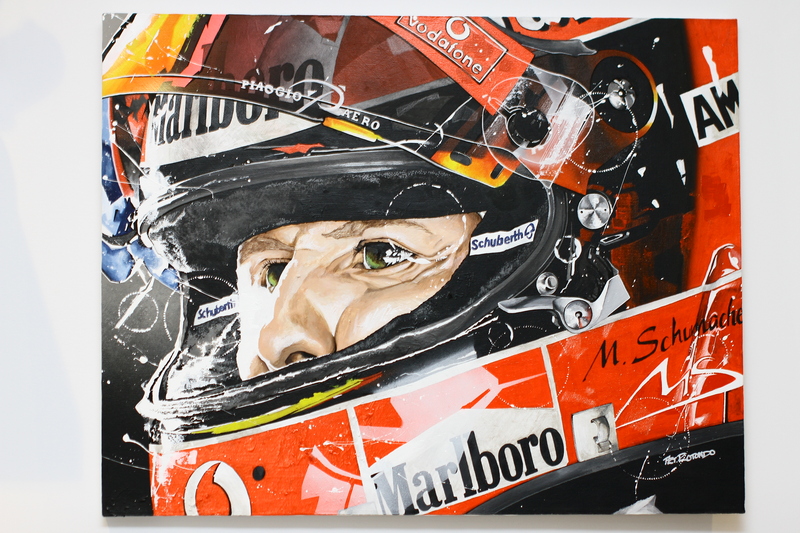 His paintings and original print lithographs hang on walls around the world, including in some of the residences of the racing world’s greats. Art Rotondo invited us into his exceptionally gifted mind and painted us a portrait of what can only be described as a passionate tribute. Let your mind be clean of all thoughts for a moment, let the canvas be blank as you enter the colourful world of Art Rotondo. DRM: How did this all start? AR: Probably the easiest way to explain it, would be to call it a homage to my father, Stefano. He became ill and eventually lost his fight with liver cancer. Formula 1 always brought us together. I grew up in a home where it was expected to watch Formula 1 on a Sunday morning or afternoon. I still remember hearing Sir Jackie Stewart commentating the races! From the days of Senna and the Schumacher era, it was a huge passion within our home. I’ve always loved the sport. Growing up, I always enjoyed drawing and painting or being artistic. I often created pieces of Formula 1 art for myself or just for fun. While I was a student at the University of Concordia, in 2004, I did my first Ayrton Senna painting for a school project in the style that I am now known for. Every piece always brings back that feeling, that bond we had with our father. 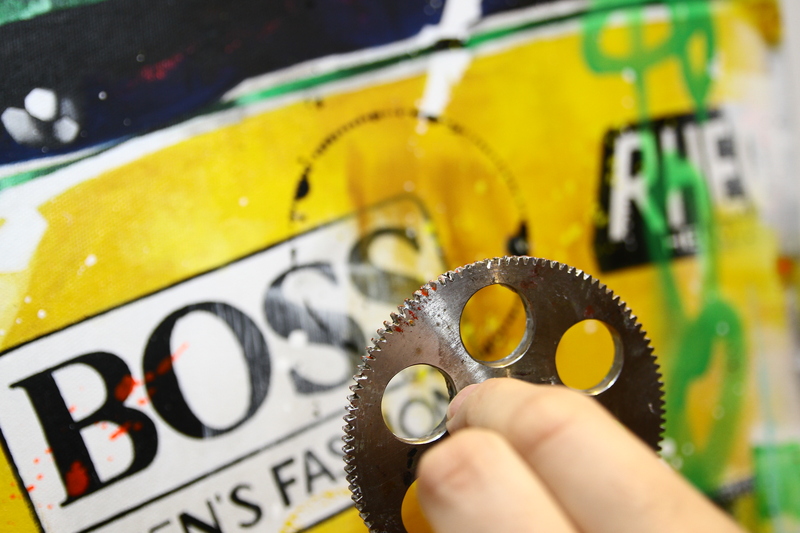 It’s funny, a lot of people assume I place a beer bottle or can on the art to create those circles you see in my work. Those perfectly round shapes you see are actually turbine airplane engine gears. My father was a machinist, and he had brought some engine pieces home. I use them in every piece I do. I only started to use them after he had passed away. There is always that part of him in my work. DRM: When did you decide this was the career you wanted? AR: In 2008. My brother Mauro has a business mind, always thinking. He saw potential in how the work I love to do could become essentially a dream job. By 2010 it became very serious and I really have to give a lot of credit to him. He helped make it possible, he’s smart and I am not only saying that because he’s my brother! I am happy saying that I wake up every morning and am doing something I love and am passionate about. DRM: Your paintings and drawings have the feel of very vivid and colourful dream. The detail is phenomenal, and they all jump off the surface they are on. What do you say causes for such a visual transformation for the viewer? Why are they so powerful? AR: Well, the goal behind every piece is to show the feeling, raw emotion and the struggle that the driver is experiencing. Those cars are not easy to drive! I want to portray the driver working, struggling as they turn into the corners. It’s literally man and machine working against each other, and together at the exact same time. I want to show the colourful artsy stuff, as well as the darker, greyer mechanical edges. DRM: How do you decide what you will create next, and how do you prepare for it? AR: I create each next piece as a heart inspired work. I do look at who is the popular driver at the moment, but I also look at which driver has that burning passion on the track. Like, Sebastian Vettel has that passion with Ferrari, and he had it with Red Bull. 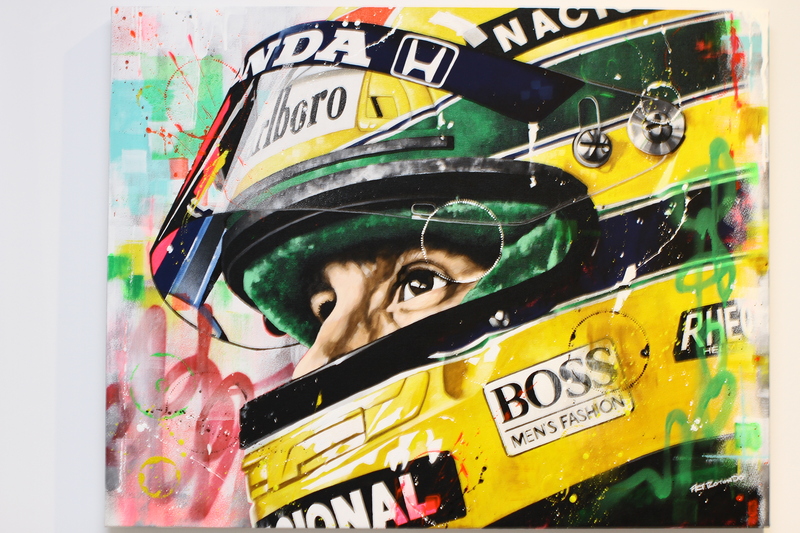 Lewis Hamilton is very passionate and is great to portray in my work. 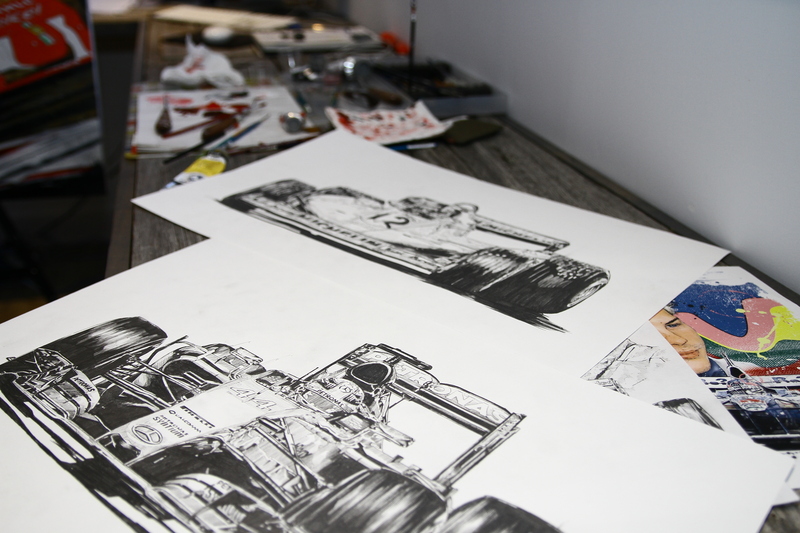 Recently, Max Verstappen is very passionate and we see how he is on the track, the excitement of watching him is easily translated onto paper and canvas. It’ll take about three or four days to draw in pencil, adding every single detail. I take my time since Formula 1 is all about perfection. A wing cannot be crooked, it has to be absolutely perfect. DRM: Has there been a driver and or car that you found to be more challenging to do, and why? AR: Not really. I can’t say one car has been more difficult than any other. I will admit I find it a little more challenging to properly create rain tyres. Those grooved tyres! It’s funny to say now that I talk about it. Funnier, is that I find myself producing more and more pieces with cars using rain tyres. DRM: You must love the challenge? AR: Yes, I do. But I mostly because the driver is also really pushing, really struggling in the rain. More so than if he was on slick rubber. DRM: There must be one driver or car you must really enjoy doing? AR: Fernando Alonso. He shows so much passion and ferociousness that it’s a lot of fun for me to try and replicate it. He just really shows it in his driving or his appearances on the podium. DRM: I want to ask you about your team, who are the members and what do they do? AR: It’s only myself and my brother Mauro. We do receive a lot of help from family and friends at events that we are involved with. I’m busy with the art portion while Mauro is busy on the on the phone, or email or even in person for the business side. DRM: I know that any artist is never truly satisfied with their work. They’ll always see an imperfection visible only to their eye, or something that they feel should be added. When do you decide a piece of work is complete? AR: I always feel there is that little something that I can do better! Everyone else will say “it’s perfect” or “you’re crazy” but I feel I can always do better. Then again, I probably would find something to make better even then! It’s a joy though, when someone tells you how much they appreciate your work, and how many pieces they own. That allows me to stop thinking about what I may have thought was an imperfection at the moment. DRM: Do you have a preference in painting, or in drawing? AR: I prefer painting, it’s a more relaxing process. There is no pencil work for my paintings and each brushstroke defines itself. There are no set borders and that allows me to have a more creative approach. Each painting becomes and feels like a textured photograph because there were no boundaries while creating it. That sense of freedom does a lot for any artist. 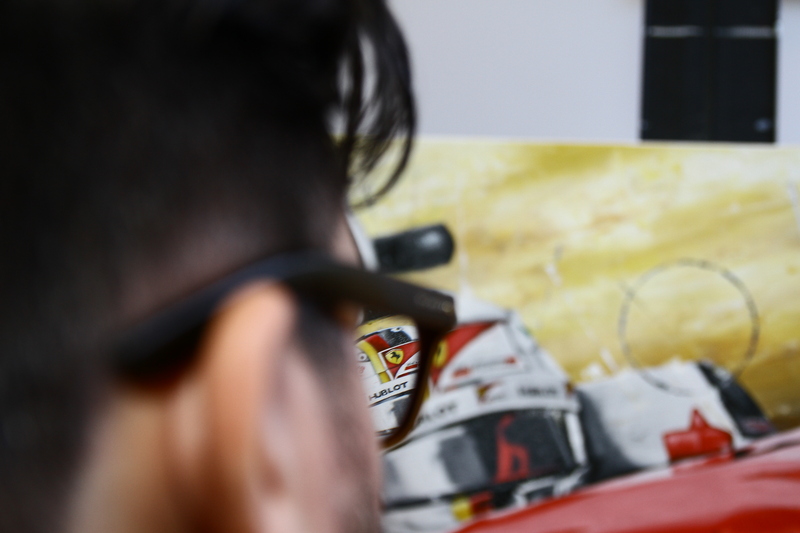 DRM: Is it a similar feeling when you are asked to design and paint helmets for drivers? AR: Not at all. Helmets are a whole other world. It can be very stressful and enjoyable at the same time. There are deadlines, colours have to apply well to the material, the clear coat must be flawless, and so on and so forth. 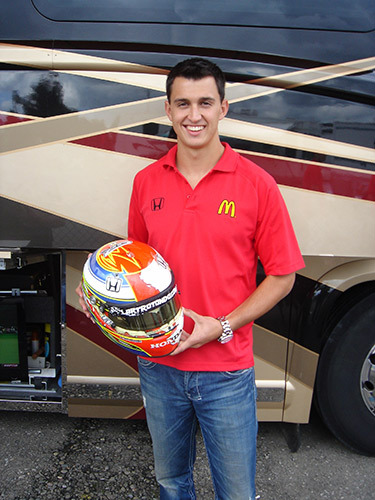 When you are painting a helmet, you are using the design and colours chosen by a driver or a team. It’s very different as opposed to creating a drawing or painting from my own imagination using my own interpretation. 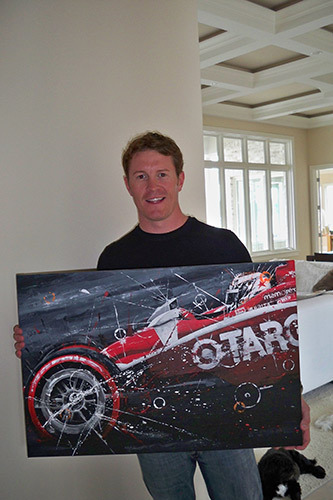 DRM: It must be a special kind of feeling knowing that your artwork has been hung in the homes of Sebastian Vettel, Dan Wheldon and others. AR: It makes me happy! 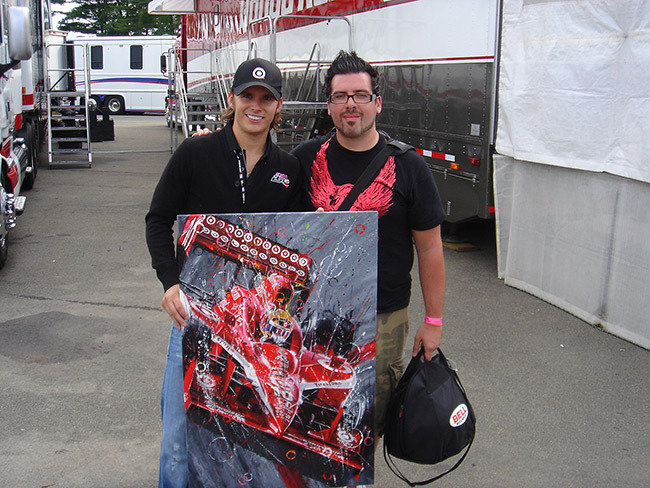 Actually, Dan Wheldon was my first customer. He was such a great guy. 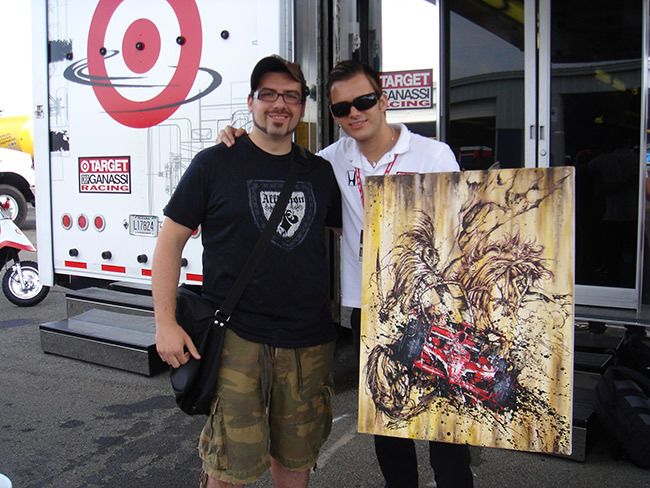 Wheldon really helped in allowing my art and name to be noticed. He’s missed by so many, myself included. 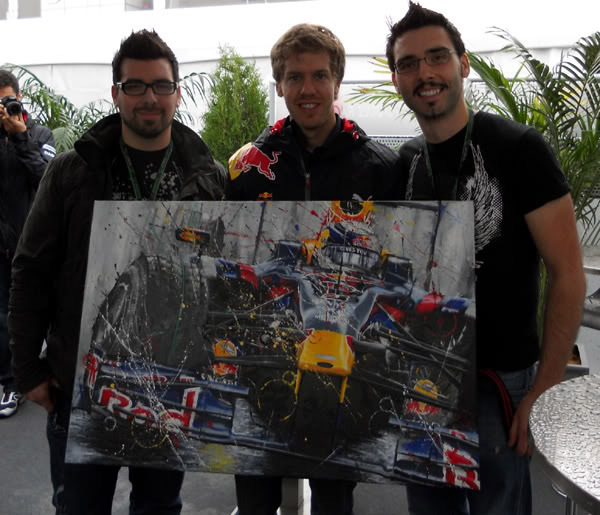 Knowing that someone like Sebastian Vettel and others have my work is a special feeling. 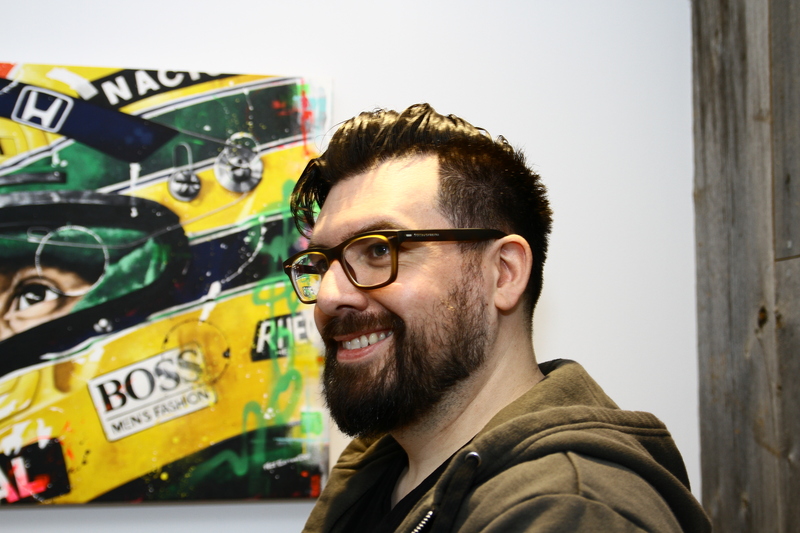 However, it’s just as great a feeling when anyone purchases one of my pieces, to be honest. Knowing that my work is appreciated by the fans is a very nice feeling. I’m glad that my passion portrayed in an artistic form is touching people enough to be warranted a space on a wall somewhere. I hear stories of how my work is in offices, basements, garages, and living rooms and it really warms my heart. 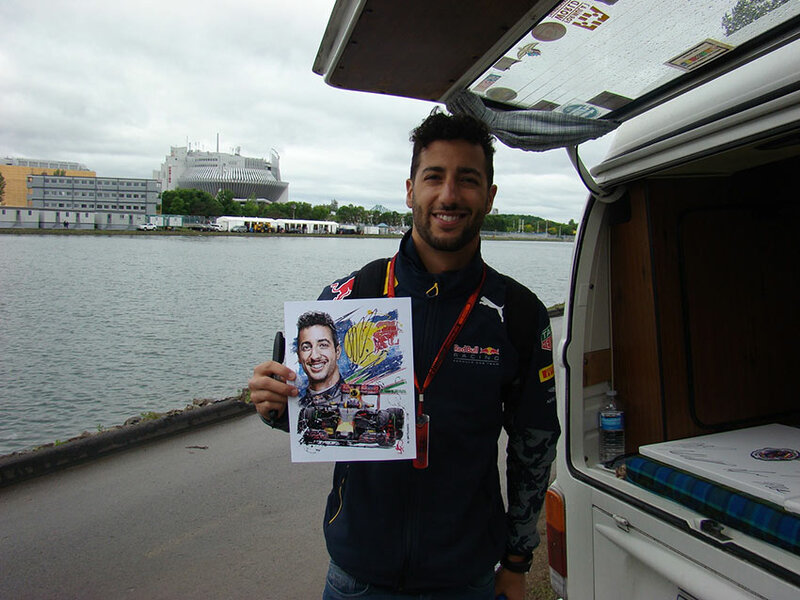 DRM: Fans that attend the Canadian Grand Prix have been seeing your work on and around the Circuit Gilles Villeneuve for a few years now. How did you become involved? AR: I was contacted by a motorsports marketing firm, as they were preparing for the first Abu Dhabi Grand Prix. They wanted to have an event and provide some insight to the people about what Formula 1 was all about. They had artists from around the world in an art gallery, and I was chosen to represent North America. All of us artists were there for the three days of the grand prix, painting and having our works displayed for all to see. One thing would lead to another and we eventually partnered with the organizers of the Canadian Grand Prix. As they say, the rest is history. DRM: If you were to choose one piece from your entire collection as your favourite, which one would it be and why? AR: My first one, titled Magic. 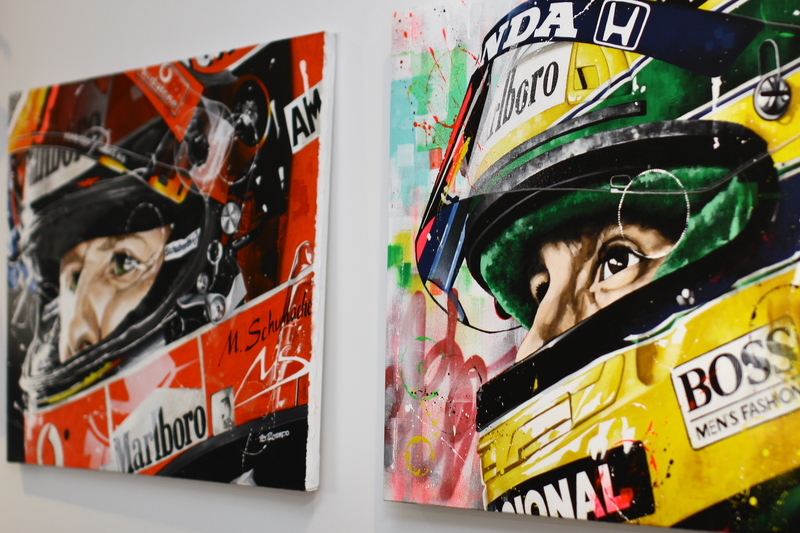 It’s an Ayrton Senna with Mclaren piece. I still own it and is one of the early pieces that my father actually saw. It’s very dear to me and it won’t be going anywhere. DRM: Finally, what advice would you give a young motorsport artist starting on this path? What would you tell your past self if you could? AR: There is a quote from Sebastian Vettel that probably describes exactly what I would say; “The moment money becomes your motivation, you are immediately not as good as someone who is stimulated by passion and internal will.” That’s what I would say. Don’t let others influence you negatively. Follow your gut, use that passion. Never give up. All below photos courtesy of Team Art Rotondo.